2015 has been a year when suddenly SharePoint has again gone BOOM!! I'm still trying to understand quite why. It has unexpectedly fought back against Google Docs. Maybe I shouldn't write that on a Blog that is hosted on Google Blogger. Last year, I had my doubts (my sleepless nights, not only about Paul Lambert's tactics) that SharePoint was going to survive. So many organisations were looking at Open Source alternatives and seemingly moving away from Microsoft's SharePoint. We considered for the first time that Action SharePoint Limited (trading as Office Talk) might have to diversify and consider more general Information Management systems. Instead of being 100% SharePoint. A pity because we're SharePoint fanatics and really believe anything is possible with SharePoint. But then it all changed. The moon of SharePoint rose again. Bigger, stronger, better and cheaper. Maybe Office 365 and people finally realising, that actually 'the cloud' is a pretty cool idea (I'm 48 now far to old to get away with saying 'cool'). Google Docs is totally in the cloud, but people are still hooked on Microsoft Office. So Office 365, with SharePoint being it's star, already has the advantage. With monthly subscriptions, even for lonely single users, SharePoint suddenly is affordable. SharePoint 2013 works now (pretty well) on all devices and even the Microsoft online support is now written in language that people who didn't study computing at Cambridge or Oxford can now understand. Unnoticed in the background, more major companies have been moving their Websites to SharePoint and it's become a one-stop solution for them. The penny suddenly dropped that they don't need a website, an Intranet and a Document Management system. They can combine them into one and save lots of pennies. It is now much easier to style your SharePoint sites (HTML and CSS are not too challenging) to get the exact branding your Marketing Department craves. Teams and departments are all starting to work together more and be more transparent. SharePoint is starting to be at the heart of all decisions. Instead of thinking we have SharePoint what can we do with it, companies are now thinking we need a new system can our existing SharePoint do it? The answer the majority of the time is, yes it can. Simple Workflows written with the free SharePoint Designer can achieve very impressive quick results and cost savings. This is sounding like an advert for SharePoint, but that's not what I am trying to say. I am really just delighted that SharePoint is now getting to play the lead role in many organisations (including the NHS, Public Sector and small private businesses) when in the past it was just treated like a extra with the occasional walk on part. SharePoint has really come of age and I believe people are ready to embrace it. Maybe we just now have a generation who have grown up with SharePoint. I have been using it now for 12 years. My slogan for this blog is really for everyone to think 'Yes SharePoint can!' What ever Project, task or challenge you face please ask first can our existing SharePoint do this? 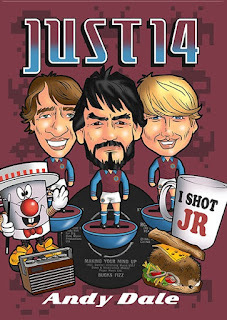 I suppose my blog wouldn't be a normal Andy blog without some Villa Chat and only ten days after Wembley some of the wounds are still a little raw. But it was a fantastic experience. I felt part of a truly Global Event. Thank you BBC for bring back the wonder of Cup Final days gone by. Admittedly many of the programmes I recorded I have not been able to face watching yet, but still thank you. We are still in the Premier League and I had two magical visit to Wembley. I get the feeling that with the incoming New Owners that Aston Villa like SharePoint are ready to rise again. Away from SharePoint my other two passions are Aston Villa and writing fiction. So I am really excited that I have combined these passions to produce my latest novel 'Just 14'. I can't miss a chance to promote it so here is the front cover and if you click on it you can pre-order a book that I am very proud of.